The “caterwaul” on Capitol Hill reflects years of determined effort by grassroots groups to end U.S. involvement in war on Yemen, fed by mounting international outrage at the last three years of war that have caused the deaths of an estimated 85,000 Yemeni children under age five. When children waste away to literally nothing while fourteen million people endure conflict-driven famine, a hue and cry—yes, a caterwaul —most certainly should be raised, worldwide. How might we understand what it would mean in the United States for fourteen million people in our country to starve? You would have to combine the populations of New York, Chicago, and Los Angeles, and imagine these cities empty of all but the painfully and slowly dying, to get a glimpse into the suffering in Yemen, where one of every two persons faces starvation. 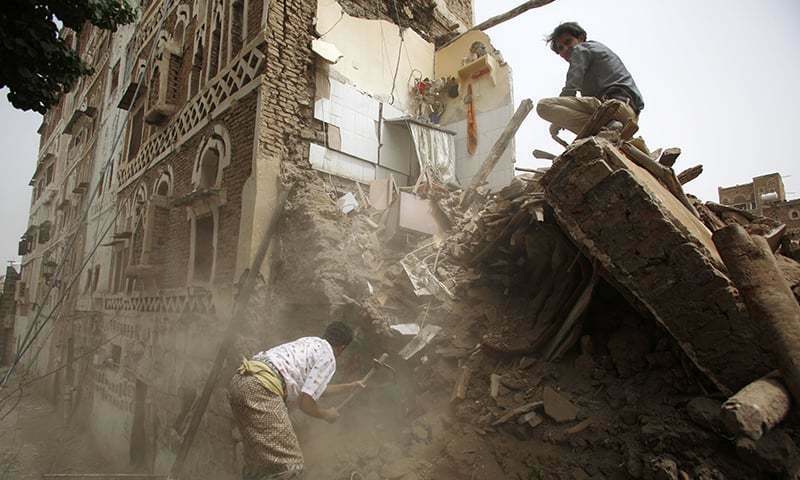 Antiwar activists have persistently challenged elected representatives to acknowledge and end the horrible consequences of modern warfare in Yemen where entire neighborhoods have been bombed , displacing millions of people; daily aerial attacks have directly targeted Yemen’s infrastructure, preventing delivery of food, safe water, fuel, and funds. The war crushes people through aerial bombing and on-the-ground fighting as well as an insidious economic war. Yemenis are strangled by import restrictions and blockades, causing non-payment of government salaries, inflation, job losses, and declining or disappearing incomes. Even when food is available, ordinary Yemenis cannot afford it. Starvation is being used as a weapon of war—by Saudi Arabia, by the United Arab Emirates, and by the superpower patrons including the United States that arm and manipulate both countries. During the thirteen years of economic sanctions against Iraq— those years between the Gulf War and the devastating U.S.-led “Shock and Awe” war that followed—I joined U.S. and U.K. activists traveling to Iraq in public defiance of the economic sanctions. We aimed to resist U.S.- and U.K.-driven policies that weakened the Iraqi regime’s opposition more than they weakened Saddam Hussein. Ostensibly democratic leaders were ready to achieve their aims by brutally sacrificing children under age five. The children died first by the hundreds, then by the thousands and eventually by the hundreds of thousands. Sitting in a Baghdad pediatric ward, I heard a delegation member, a young nurse from the U.K., begin to absorb the cruelty inflicted on mothers and children. “I think I understand,” murmured Martin Thomas, “It’s a death row for infants.” Children gasped their last breaths while their parents suffered a pile-up of anguish, wave after wave. We should remain haunted by those children’s short lives. Iraq’s children died amid an eerie and menacing silence on the part of mainstream media and most elected U.S. officials. No caterwauling was heard on Capitol Hill. But, worldwide, people began to know that children were paying the price of abysmally failed policies, and millions of people opposed the 2003 Shock and Awe war. Still the abusive and greedy policies continue. The U.S. and its allies built up permanent warfare states to secure consistent exploitation of resources outside their own territories. During and after the Arab Spring, numerous Yemenis resisted dangerously unfair austerity measures that the Gulf Cooperation Council and the U.S. insisted they must accept. Professor Isa Blumi, who notes that generations of Yemeni fighters have refused to acquiesce to foreign invasion and intervention, presents evidence that Saudi Arabia and the UAE now orchestrate war on Yemen to advance their own financial interests. In the case of Saudi Arabia, Blumi states that although Crown Prince Mohammad bin Salman wants to author an IPO (Initial Public Offering), for the Saudi state oil company, Aramco, no major investors would likely participate. Investment firms know the Saudis pay cash for their imports, including billions of dollars’ worth of weaponry, because they are depleting resources within their own territory. This, in part, explains the desperate efforts to take over Yemen’s offshore oil reserves and other strategic assets. Recent polls indicate that most Americans don’t favor U.S. war on Yemen. Surely, our security is not enhanced if the U.S. continues to structure its foreign policy on fear, prejudice, greed, and overwhelming military force. The movements that pressured the U.S. Senate to reject current U.S. foreign policy regarding Saudi Arabia and its war on Yemen will continue raising voices. Collectively, we’ll work toward raising the lament, pressuring the media and civil society to insist that slaughtering children will never solve problems. This article first appeared on the website of The Progressive magazine.